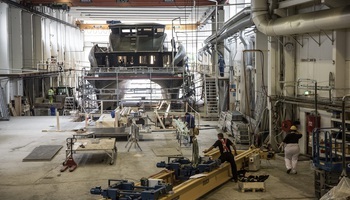 Shipbuilders Brødrene Aa, whose shipyard is located in Hyen on the west coast of Norway, have relied on lightweight construction materials and composite solutions since the 1970s. 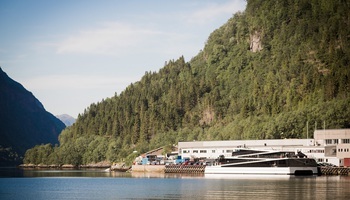 The sight-seeing ship Vision Of The Fjords, which was recently built using SAERTEX carbon fibers, is visionary in many respects: The hull and superstructures consist largely of carbon parts and the ship has one of the most state-of-the-art hybrid drives. Our customer, Brødrene Aa, was commissioned to develop a ship for use on tourist excursions in the longest and deepest fjord in Europe. Combining both mass tourism and the beauty of untouched nature was a great challenge. At the same time, the Norwegian government set ambitious targets and objectives for the reduction of emissions in the country’s ferry operations. The Nærøyfjord has been a UNESCO World Heritage Site for many years and will be the area of operations for the new ship which was designed as a catamaran. As a result, the requirements stipulated that the ferry should operate quietly and preserve the environment. The landscape surrounding the fjord was actually included in the design of the ship. The so-called “Trollstigen” – a historic serpentine path – served as the template for the innovative decks which wind upward in a diagonal zigzag design. 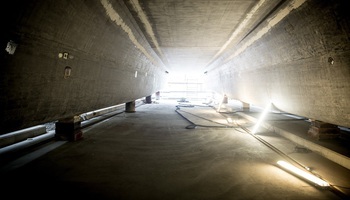 Brødrene Aa consistently used lightweight construction methods to achieve its objectives to reduce noise and exhaust emissions. With a length of 41 meters and a width of 15 meters, the ship holds up to 400 passengers. Nonetheless, the ship’s hull, decks and superstructures consist largely of lightweight carbon sandwich laminate instead of solid aluminum or steel. The resulting weight savings of nearly 50 percent made the practical use of a hybrid drive possible, leading to a reduction in emission values of more than 20 percent. Ninety percent of the carbon emissions generated during a ship’s service life occur while the vessel is in operation. 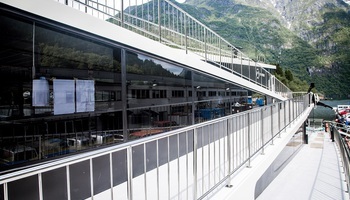 That is why the companies and engineers involved in the development of the Vision Of The Fjords collaborated on precisely this feature to combine an energy-saving catamaran design with the use of lightweight, durable materials, and ecological drive technology. Component parts made of carbon were used to replace structural components which were previously made of steel and aluminum. These component parts were based on multiaxial carbon fiber non-crimp fabrics made by SAERTEX. Their fiber orientation and number of layers were adapted to this specific project, depending on component requirements. Unidirectional, biaxial, triaxial, and quadraxial non-crimp fabric designs were used on the Vision Of The Fjords, depending on the mechanical requirements. The technical highlight, as well as the greatest challenge during this project, was the production of the hull parts using carbon. 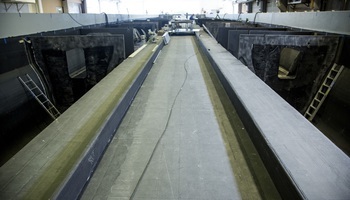 The parts measuring 41 meters long and 5 meters high were impregnated with a special resin using the vacuum infusion process. Here, it was necessary to keep the drapability of the non-crimp fabric as high as possible in the mold and for as long as possible. The SAERTEX development team conducted research in the laboratory on the best way to combine carbon fiber non-crimp fabric, flow properties, and vinyl ester resin. Together with decades of expertise amassed by Brødrene Aa employees, all this resulted in the successful completion of the project. In less than one year of development time, Brødrene Aa was able to complete the visionary ship project. 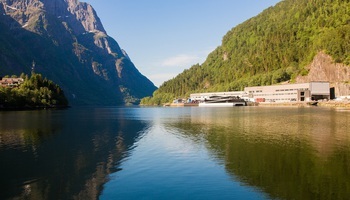 The Vision Of The Fjords has operated on the 32-kilometer route between the ports of Flåm and Gudvangenund since July 2016. Approximately 700 trips are scheduled for the Vision Of The Fjords every year. On the most scenic part of the passage, the Vision Of The Fjords glides almost silently at 10 knots through the fjord landscape on electric-only drive, enabling tourists to experience the impressive wonders of nature sustainably. When the diesel engines are used, the Vision Of The Fjords can reach 19 knots. 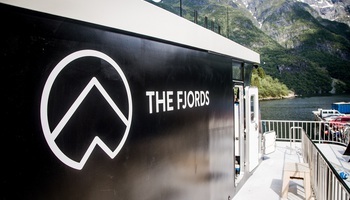 The shipping company “The Fjords AS” has already commissioned more ferries of the same design. SAERTEX also congratulates Brødrene Aa on receiving the prestigious “Ship Of The Year 2016” award which was handed over to the Norwegian shipbuilders at this year’s SMM maritime trade fair in Hamburg.